Background and objectives Patients with advanced chronic kidney disease (CKD) are in positive phosphorus balance, but phosphorus levels are maintained in the normal range through phosphaturia induced by increases in fibroblast growth factor-23 (FGF23) and parathyroid hormone (PTH). This provides the rationale for recommendations to restrict dietary phosphate intake to 800 mg/d. However, the protein source of the phosphate may also be important. Design, setting, participants, & measurements We conducted a crossover trial in nine patients with a mean estimated GFR of 32 ml/min to directly compare vegetarian and meat diets with equivalent nutrients prepared by clinical research staff. During the last 24 hours of each 7-day diet period, subjects were hospitalized in a research center and urine and blood were frequently monitored. Results The results indicated that 1 week of a vegetarian diet led to lower serum phosphorus levels and decreased FGF23 levels. The inpatient stay demonstrated similar diurnal variation for blood phosphorus, calcium, PTH, and urine fractional excretion of phosphorus but significant differences between the vegetarian and meat diets. 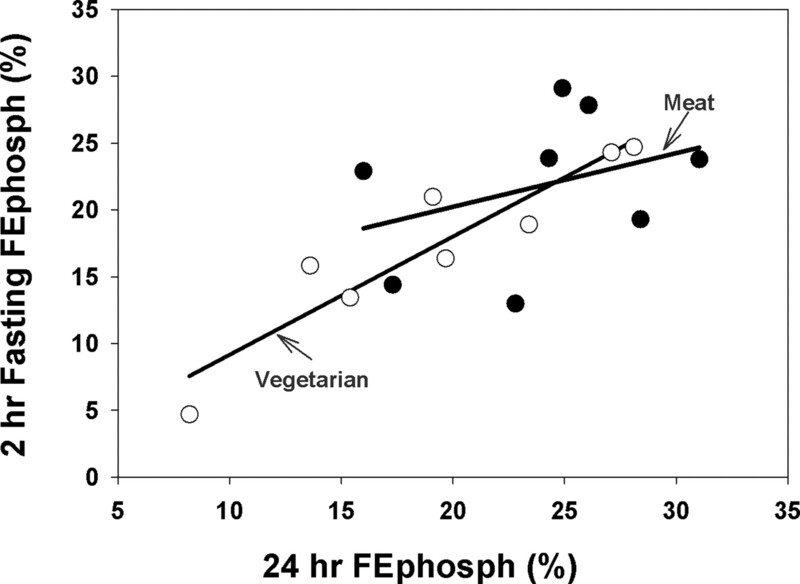 Finally, the 24-hour fractional excretion of phosphorus was highly correlated to a 2-hour fasting urine collection for the vegetarian diet but not the meat diet. Conclusions In summary, this study demonstrates that the source of protein has a significant effect on phosphorus homeostasis in patients with CKD. Therefore, dietary counseling of patients with CKD must include information on not only the amount of phosphate but also the source of protein from which the phosphate derives. Disturbances in mineral metabolism are common complications of chronic kidney disease (CKD), beginning at approximately CKD stage 3 and 4. The damaged kidney is unable to fully excrete a phosphorus load, which leads to compensatory secondary hyperparathyroidism and elevations in fibroblast growth factor-23 (FGF23) in an attempt to increase urinary phosphorus excretion to maintain phosphorus balance (1,2). However, once the GFR falls below 20 ml/min, hyperphosphatemia is common (3). In theory, a low phosphate diet and/or the administration of phosphate binders to individuals with CKD stages 3 and 4, even in the setting of normal serum phosphorus levels, may prevent the development of these abnormalities (4–7). However, there are no human clinical trials that have clearly demonstrated that lowering dietary phosphate absorption in patients with normal phosphorus levels can prevent hyperparathyroidism or elevations in FGF23. Unfortunately, dietary restriction of phosphate is difficult because of the high phosphate content of the typical Western diet from dairy products and protein sources. Protein sources of phosphate may be meat/casein or vegetarian/grain in origin, and these sources differ. The grain-based diet has a lower phosphate-to-protein ratio and much of the phosphate is in the form of phytate, which is not absorbed by most mammals. Therefore, grain-based vegetarian diets may theoretically lead to decreased phosphorus absorption compared with meat- or casein-based diets. In a rat model of CKD/mineral and bone disorder, we reported that when animals at 50% normal GFR are fed a grain-based diet compared with standard synthetic casein animal diets, the serum phosphorus, urinary phosphorus excretion, and serum levels of FGF23 are lower (8). The purpose of the study presented here is to determine if the dietary protein source of phosphate influences phosphorus metabolism and hormonal changes in humans because this would affect dietary recommendations. We show that equivalent total protein and phosphorus from grain-based vegetarian sources has a significant effect on serum phosphorus and on the homeostatic response to dietary phosphate intake. This was a crossover trial of two diets in patients with CKD stage late 3 or stage 4 (estimated GFR [eGFR] 25 to 40 ml/min) and normal serum phosphorus (see study design in Figure 1). Patients underwent baseline blood tests and 24-hour urine collection. They were then randomized to initially receive either a grain/soy- (referred to as vegetarian) or meat/dairy- (referred to as meat) based protein diet to eat for 7 days. 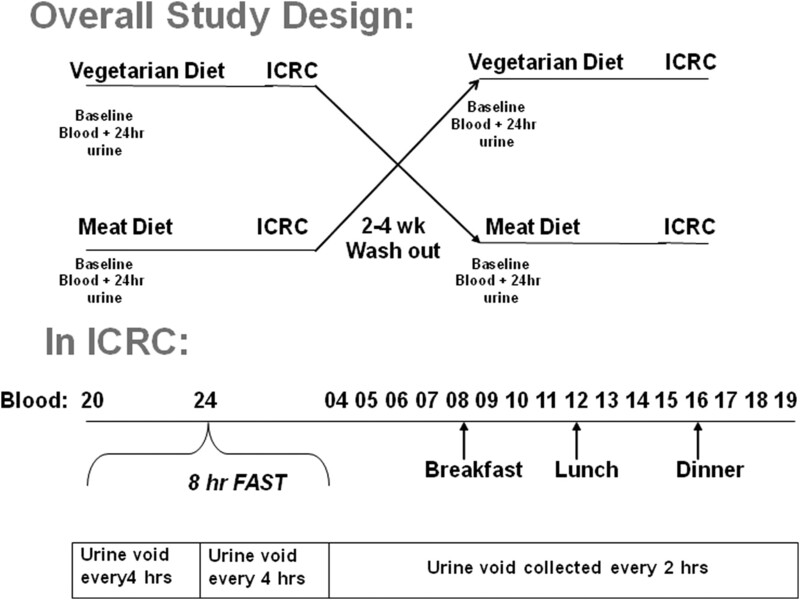 During the last 24 hours of each diet, the subjects were admitted to the Indiana Clinical Research Center (ICRC) and continued receiving the same diet with blood and urine collected as depicted in Figure 1. Blood was additionally drawn 30 minutes after each of the three meals. The subjects were then washed out for 2 to 4 weeks and received the opposite diet treatment with the study procedures repeated. Overall study design: The top panel demonstrates the overall crossover design, and the lower panel depicts urine and blood sampling during the 24-hour Indiana Clinical Research Center (ICRC) inpatient stay. Subjects were recruited from nephrology clinics and were asked to participate if they met the following inclusion criteria: (1) age > 18 years; (2) eGFR 20 to 45 ml/min by modified four-parameter Modification of Diet in Renal Disease equation; (3) urine protein/creatinine ratio < 5; (4) blood pressure < 150/95 mmHg; (5) not taking calcium binder or supplements, vitamin D, or phosphate binders; (6) normal serum phosphorus and calcium corrected for albumin and intact parathyroid hormone (PTH) < 100 pg/ml; (7) medically stable; and (8) able to give informed consent and come for all visits. All subjects gave informed consent and the Indiana University–Purdue University Indianapolis/Clarian Institutional Review Board approved the study (NCT00764816). Diet planning and analysis was initially done using the Minnesota Nutrition Data system software as has been previously reported and implemented in our ICRC (9). The diets were designed to be isocaloric (2200 kcal), containing 1000 mg of calcium and 3000 mg of sodium per day. The protein and total phosphorus concentration were equivalent, with a target of 1200 mg/d of phosphorus and an initial goal of 20% protein on the basis of the software, in which the phosphorus content is determined biochemically. Once formulated, the foods were frozen, lyophilized, wet-ashed using nitric and perchloric acid, and photometrically analyzed for phosphorus content. The actual measured phosphorus content was approximately 33% less for the vegetarian diet than that predicted from the database, but the meat diet matched the database. Therefore we reduced the phosphorus content of the meat diet by reducing the milk intake because this phosphorus content was the most predictable, with a final diet of approximately 800 mg per day to match the measured phosphorus of the vegetarian diet. All food was prepared by ICRC staff and given to the subjects. Each treatment diet (vegetarian or meat) consisted of the same diet repeated every other day for each arm. The final composition of the diets is listed in Table 1, and no preservatives were used. At baseline of each of the two treatment arms, patients collected a 24-hour urine collection the day before beginning dietary intervention. The same collection system and preservative was used during the ICRC stay in which 2 ml of urine from each of the timed urine collections were analyzed separately, and the remaining urine was pooled to give a 24-hour urine assessment that was compared with baseline values. Urine was evaluated by Litholink for urinary phosphorus, creatinine, sodium, uric acid, citrate, ammonium, protein-to-creatinine ratio, and sulfate using their commercially available system (http://www.litholink.com). Blood was analyzed for intact PTH using the DiaSorin 26100 IRMA assay (DiaSorin, Stillwater, MN) and intact FGF23 (Kainos Laboratories International; Tokyo, Japan) by batched analyses at the end of the study. Vitamin D (D2 + D3 and total) was analyzed by liquid chromatography/mass spectroscopy and liquid chromatography/tandem mass spectroscopy (Mayo Clinic Laboratory, Rochester, MN). We calculated that an 80% power would require n = 5 to determine differences in phosphaturia and n = 8 to detect differences in FGF23, similar to other crossover trials (10). The comparisons of blood and urinary measures after 1 week of outpatient diet was analyzed with paired t tests or signed rank test if not normally distributed. This compared the results at the end of 1 week of the standardized outpatient diet to the results at the end of 1 week of the second diet, with all laboratory values drawn at exactly the same time (8:00 p.m., the first collection time point of inpatient stay, which represents the end of the outpatient period). Regressions were calculated using Pearson Product Moment. (SigmaPlot, Chicago, IL). For the ICRC 24-hour inpatient studies, the outcomes were analyzed using linear mixed-effects models to compare the overall levels of each of the variables during the 24-hour inpatient time period. A subject-level random intercept was specified to account for the within-subject correlation from the repeated measures. Independent variables included period (period 1 or period 2) and dietary protein source (meat or vegetarian) as fixed effects. To assess whether the effect of dietary source was dependent on the order in which the diets were assigned, models including the interaction between period and dietary source were tested first. The interactions were NS; therefore, models including dietary protein source adjusting for period were specified. Results are expressed as mean ± SD, with the exception of standard errors used for the graphs of data obtained during the inpatient stay. A significance level of α = 0.05 was used for statistical tests. Analyses were performed using SAS version 9.1 (SAS Institute, Cary, NC). Eleven patients were consented; two failed screening because of eGFR greater than the inclusion criteria. Nine patients were enrolled. One patient dropped out after the first arm complaining of hunger. Thus, eight patients completed both arms and were further analyzed. There were four women and four men, one subject was Hispanic and the others were Caucasian, the mean age was 61 ± 8.4 years, the mean eGFR by the four-parameter Modification of Diet in Renal Disease equation was 32.3 ± 6 ml/min, and the mean body mass index was 32 ± 5. The cause of CKD was hypertension in one subject, diabetes in two subjects, GN in one subject, urologic abnormalities in two subjects, and cause was unknown in two subjects. Comorbid conditions included diabetes in four subjects and hypertension in six subjects. Five subjects were on diuretics and three subjects were on angiotensin converting enzyme inhibitors or receptor blockers, all of which were constant the month before and during the study. The mean 25-hydroxy-vitamin D level (total D2 + D3) was 23 ± 12 ng/ml (range 6 to 41), and the mean 1,25-dihydroxy-vitamin D level was 21 ± 8 pg/ml (range 8 to 36). The time between the two treatment arms was 17 to 30 days. The baseline serum phosphorus levels, 24-hour urine phosphorus values, and serum albumin levels were not different at the beginning of each arm, confirming no carryover effect. Table 2 shows the results from the 7 days of ICRC-prepared outpatient diet. The dietary compliance was high by food frequency questionnaire, and the average daily phosphorus intake was only slightly lower in the meat diet compared with the grain vegetable diet (795 ± 51 mg versus 810 ± 27 mg/d). After 1 week of each of the diets, there was a higher serum phosphorus, FGF23, and lower PTH in the meat diet compared with the vegetarian diet (Table 2). The urinary phosphorus excretion was greater in the meat diet group, although it did not reach significance (P = 0.07). There was no difference in the plasma sodium, calcium, or creatinine nor the 24-hour urine sodium, calcium, or nitrogen between the two diets. However, there was a trend for decreased urine pH and ammonium excretion in the meat versus vegetarian diet (pH: 6.6 ± 0.7 versus 7.0 ± 0.6 U, P = 0.2; ammonium: 5.6 ± 2.8 versus 9.9 ± 6.4 mmol/d, P = 0.07). There was a significant correlation between the change in plasma phosphorus concentration and the change in FGF23 (r = 0.54, P = 0.03), but no relationship with 25-hydroxy-vitamin D, 1,25-dihydroxy-vitamin D, or PTH. During the inpatient stay, the dietary compliance was nearly perfect with a median intake of 817 mg phosphorus (25% to 75% = 814 to 817 mg/24-h period) for the meat diet, and 813 mg phosphorus (25% to 75% = 801 to 818 mg/24-h period) for the vegetarian diet. Average serum phosphorus, PTH, fractional excretion of phosphorus (FePhosph), and calcium over time are graphed in Figure 2. As can be observed, there was a significantly higher average serum phosphorus (3.6 versus 3.3 mg/dl, P < 0.0001), calcium (9.1 versus 8.8 mg/dl, P = 0.0001), and FePhosph (24 versus 18%, P = 0.0001) and lower PTH (44 versus 52 pg/ml, P = 0.0002) with the meat-based diet compared with the vegetarian diet. To determine if a random urine FEPhosph correlated with the 24-hour urine FEPhosph, we compared the 2-hour aliquot collected from 4:00 to 6:00 a.m. after an 8-hour fast to the 24-hour collection (Figure 3). By regression analyses, there was a good relationship between these two specimens for subjects on the vegetarian diet (r2 = 0.71, P = 0.009) but not the meat diet (r2 = 0.13, P = 0.39). If we combine the two diet results, the r2 drops to 0.46, P = 0.004. Diurnal variation of blood and urine studies on Vegetarian compared with Meat Diet: Subjects were admitted to the Indiana Clinical Research Center for 24 hours at the end of each 7-day diet period. Timed urine and blood samples were collected. The diurnal variation for blood levels of phosphorus (A), calcium (B), intact PTH (C), and the urine fractional excretion of phosphorus (FEPhosph, D) are graphed for the two diets with mean ± SE. The timing of the meals are depicted as B = breakfast, L = lunch, and D = dinner. The diurnal variation was similar for the two diets. However, the phosphorus, calcium, and FEphosph were all higher for the meat diet compared with the vegetarian diet, and the PTH was lower. Relationship between 24-hour urine and fasting 2-hour urine for FEphosphorus. This graph demonstrates the relationship between the 24-hour urine FEphosph and the morning 2-hour random FEphosph. The regression curves are demonstrated for each of the diets. ●, meat diet; ○, vegetarian diet. Our study demonstrates the importance of the protein source of phosphate in overall mineral metabolism after only 7 days of controlled diets. Despite equivalent protein and phosphorus concentrations in the diets, subjects had lower serum phosphorus levels, a trend toward decreased urine 24-hour phosphorus excretion, and significantly decreased FGF23 levels in the vegetarian diet compared with the meat-based diet. These results, if confirmed in longer studies, provide rationale for recommending a predominance of grain-based vegetarian sources of protein to patients with CKD. This will allow increased protein intake without adversely affecting phosphorus levels. This study also demonstrates the complexity of implementing dietary phosphate reduction. Our direct analyses found that the vegetarian diet phosphate content was lower than predicted by standard databases, indicating that traditional methods of calculating intake from food databases may not be accurate in vegetarian diets, despite both calculations being derived from analytical methods that should have measured phytate- and nonphytate-bound phosphate. These inaccuracies, together with hidden phosphate preservatives (11), make dietary counseling of a low-phosphate diet difficult, and dietary adherence by patients nearly impossible. Two other studies have compared these diets in patients with kidney disease to determine the effects on proteinuria. In men with type 2 diabetes and nephropathy defined as albuminuria <2000 mg/d and creatinine <1.5 mg/dl (stage 1 to 2 CKD), a crossover trial demonstrated that replacing 0.5 g/kg of total dietary protein intake with soy compared with casein powders for 8 weeks led to a 9% reduction in albumin excretion and improved cholesterol (12). The serum phosphorus levels in this study by Teixeira (12) did not significantly change. In contrast, Azadbakht et al. (13) studied patients with more advanced diabetic nephropathy (macroalbuminuria and serum creatinine between 1 and 2.5 mg/d). They demonstrated in a crossover trial that 7 weeks of a 65% vegetarian diet, compared with a 70% animal-based diet, reduced albuminuria and urine urea nitrogen. They also reported that the serum phosphorus levels significantly decreased by 0.2 ± 0.3 mg/dl in the vegetarian diet compared with 0.03 ± 0.2 mg/dl in the meat diet. PTH and FGF23 levels were not reported. Our results are consistent with their findings, although we observed more dramatic differences (0.5 mg/dl) after only 1 week, perhaps because of the pure vegetarian or meat diets used in our study. Taken together, vegetarian-based diets may be beneficial for the control of phosphorus homeostasis in patients with CKD. This may be due to decreased bioavailability of phytate-bound phosphorus and/or the higher availability of protein in meat-based diets could place additional strain on the kidney. Animal studies will be required to elucidate the mechanism. Our study also demonstrated that these diets, with their resulting differences in serum phosphorus levels, led to differences in FGF23 after only 1 week. FGF23 is a phosphatonin that is released in response to changes in serum phosphorus from osteoblasts and osteocytes, with a primary function to increase urinary phosphorus excretion. FGF23 levels increase with progressive deterioration in renal function (14,15), and FGF23 levels at the start of dialysis are highly predictive of mortality (16). Studies that have evaluated short-term effects of low-phosphate diet or phosphate supplementation have failed to find changes in FGF23 in healthy individuals after 6 hours (17) or 2 to 3 days (14). This led one author to conclude that FGF23 “was not associated with rapid adaptation of phosphate homeostasis” (17). In contrast, in a crossover study in 29 healthy men studied as outpatients, phosphate depletion induced with 5 days of aluminum hydroxide or phosphate supplementation using oral potassium-phosphorus syrup decreased and increased FGF23 levels, respectively (18). Another randomized study of 66 healthy individuals found higher FGF23 levels with the higher phosphate diet (19). However, in CKD, there are very limited data. Isakova et al. (20) found no increase in urinary phosphorus excretion or FGF23 in CKD patients compared with controls 4 hours after a standardized meal despite elevated baseline FGF23 levels in the CKD patients, supporting no acute role of FGF23 in phosphorus homeostasis in CKD. Oliveira and colleagues randomized 40 normophosphatemic CKD patients to sevelamer or calcium carbonate and found that urinary phosphorus excretion and PTH decreased in both arms, but FGF23 only decreased in the sevelamer arm (21). Our study is the first to our knowledge that compares the effect of protein source of phosphate on FGF23 levels and demonstrates that diet affects FGF23. These results suggest that FGF23 is an appropriate biomarker for phosphorus intake and thus may be a useful surrogate endpoint for diet and phosphate binder trials in patients with normal phosphorus levels. The interaction of diet and phosphate binders will require additional studies. We also evaluated the diurnal variation of blood and urinary phosphorus in patients with advanced CKD, knowledge that may affect the conduct of clinical trials in this field. In healthy individuals, there is a diurnal variation: Phosphorus levels reach a nadir in early morning, with an increase to a plateau at 4:00 p.m. and a further increase to a peak at 1:00 to 3:00 a.m. (22). Urinary phosphorus excretion parallels these changes (22). Similar results were found in patients with hypercalcuria and nephrolithiasis (23). However, another study found no diurnal variation in patients on dialysis when studied on a nondialysis day (24). In the study presented here of advanced CKD subjects, we found a diurnal variation, but it was substantially blunted compared with published results in healthy men (22). These studies suggest that as kidney disease advances, the stimuli for diurnal variation may be altered. If so, then random urine phosphorus excretion may be an alternative to the currently recommended 24-hour urine collection. However, we did not find that fasting random urine collections offer such an alternative. Multiple epidemiologic studies have identified hyperphosphatemia as an independent risk factor for mortality with any phosphorus level above the normal range (25,26). Importantly, these findings are not limited to dialysis patients. In patients with CKD stages 3 and 4 there is also an increased risk of mortality with progressive increases in serum phosphorus above 3.5 mg/dl (27). Increased serum phosphorus (in the high normal range) has also been associated with increased mortality and cardiovascular events in patients with documented coronary artery disease but no identifiable CKD (28). Another study found an association of higher phosphorus levels with atherosclerotic burden on angiography in patients without CKD (29). Our study demonstrates that dietary source of phosphate may be at least partially responsible for these observations because these individuals may be more likely to eat meat-based diets, which also contain more cholesterol and other proatherogenic factors. Thus, future studies should be more rigorously controlled for dietary intake. Finally, our study also demonstrated that the meat-based diet led to a decrease in PTH. The serum calcium levels on the two outpatient diets were not significantly different, although we only measured total calcium, and therefore the ionized calcium may have been different (30). However, we did see a difference in the PTH and calcium during the 24-hour inpatient stay. Subjects ingesting the meat-based diet had overall greater calcium level over the 24-hour period (9.1 versus 8.8 mg/dl, P = 0.0001) and a lower PTH level. The reason for the difference in serum calcium is not known because the diets did contain nearly equivalent calcium content. However, the phytate in the vegetarian diet can bind calcium (31); therefore, intestinal absorption of calcium may be greater with a meat diet that has less phytate. Finally, the elevation in FGF23 observed with the meat diet may also have suppressed PTH because recent studies have demonstrated a direct effect of FGF23 on PTH synthesis and secretion (32,33) before hyperplasia of the gland (34). Clearly long-term studies are required to determine if these differences persist and if it is observed in patients with more advanced secondary hyperparathyroidism. In summary, in the Western diet, phosphorus is ingested primarily in the source of protein and dairy products, as well as preservative/additives. Although we advise our CKD patients to follow a phosphate-restricted diet, we rarely discuss the protein source of phosphate, which we have now demonstrated to be important. Dietary counseling for CKD patients is complex and patients are frequently confused by the multitude of recommendations. Simplifying the approach by asking them to eat more grains and less meat and less preprepared/packaged foods (11,35) may lead to increased dietary adherence and improved phosphorus homeostasis. Our study is limited by its sample size and duration; therefore, larger studies demonstrating the feasibility of such an approach over an extended time period are needed. S.M. is a consultant and has received honoraria and/or grant support from Shire, Genzyme, Ineos, DiaSorin, and Amgen. S.D. and J.A. are employees of Litholink. This study was supported by an investigator-initiated unrestricted grant from Shire and the Indiana Clinical and Translational Sciences Institute, Indiana Clinical Research Center (National Institutes of Health [NIH] UL RR025761). Dr. Moe is also supported by NIH (NIH-DK002775). The authors thank Timothy Stump for his assistance in the statistical analyses, Dr. Ranjani Moorthi for her constructive review of the manuscript, the ICRC nurses and staff, and the dedicated research subjects. See related editorial, “Source Matters: From Phosphorus Load to Bioavailability,” on pages 239–240.